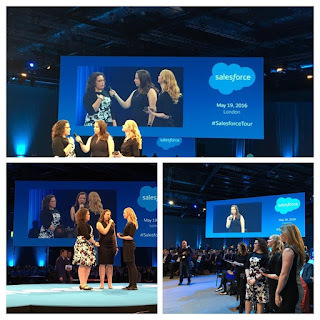 Now I am not usually a glass half empty kinda gal but I can't help but dwell on all the things that I missed at this month's Salesforce World Tour in London. 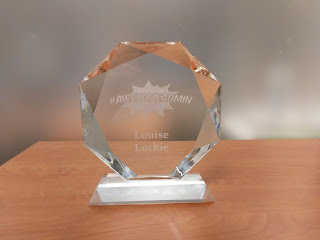 Now that we have that out of the way (sulking over) let's get onto all the reasons why I had a completely #Awesome day. Due to terribly bad timing, last year's World Tour clashed with my birthday plans to spend the day at Lord's watching the cricket in the sun. Having missed a year I was determined to get involved this year, and that I did. I signed up to staff the first session at the Trailhead Hands-on Zone (which meant an 8am start), the Customise Salesforce stand from 2pm to 4pm, as well as deliver my talk 'Achieving Awesome Adoption Through Training & Support' at 12.30pm. I knew I was going to be busy but then Kris Lande from the #AwesomeAdmin team contacted me to say that I was to be the recipient of the London #AwesomeAdmin award! My day was promising to be one to remember. And it most certainly was. My first stop was to pick up my Trailhead Zone t-shirt. It wasn't quite the look I was going for, over the top of my dress, but who doesn't love wearing a t-shirt with the word EXPERT on the back? At 8am it was quiet, we had a moment to check out our surroundings, enough time for me to realise that I would need to quickly find my way around a mac (!) 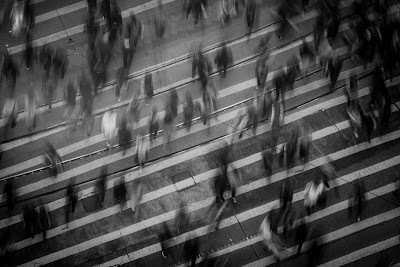 and then before I even had time for a cup of tea, the crowds descended. We had 20 workstations and they were soon full of attendees eager to hit the trail. I was asked what Trailhead was several times, I refrained from enquiring as to under which rock they had been hiding, and instead explained what a great interactive learning tool it is. The time flew by and before I knew it Kris Lande arrived to whisk me off to the keynote room to meet Peter Coffee and Jessica Hood. 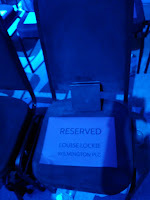 I was rather excited to have a reserved seat (it is the small things in life), and within a blink of an eye I was being called to the stage. The whole two and a half minutes has been captured forevermore on YouTube, needless to say it felt like two and a half seconds! It was an absolute honour to be chosen, we have a wonderful community in the UK, and I thank those who nominated me. 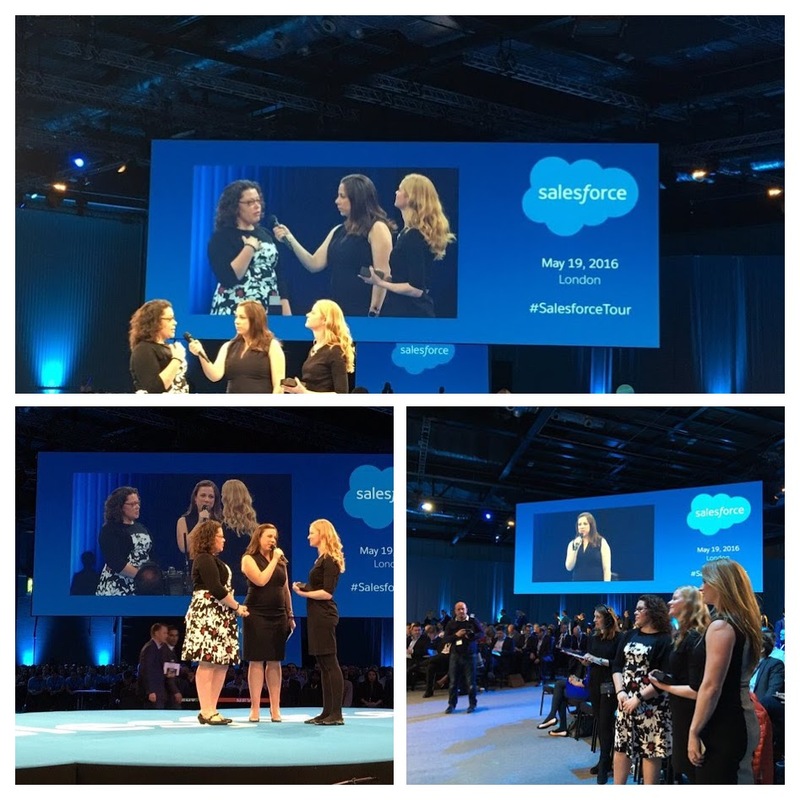 I had the rest of the keynote to catch my breath, as well as enjoy the content, as usual Salesforce put on a great show and I was thrilled to see Anne-Marie Imafidon take to the stage to talk about the fabulous work carried out by her organisation Stemettes. The audience were amazing, (I felt) the session went really well, and though I had no time for Q&A, quite a number of people came up to me over the course of the afternoon, asking to connect online, for further advice, or just to say that they had enjoyed the talk. 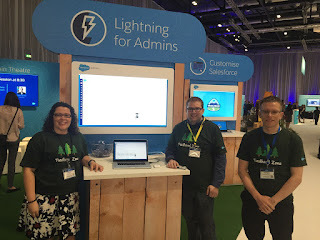 I was thrilled with the response and came away feeling like I had really contributed to the day, and with a renewed conviction to submit a talk for Dreamforce! 2pm arrived and I was back in my EXPERT t-shirt and before I even took my place at the Customise Salesforce stand I was approached for assistance. I did not take a breath for the next 120 mins, there was always a queue and the questions were varied, interesting and challenging. 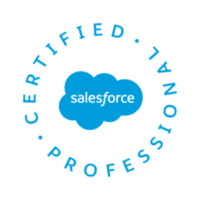 I would have to say that these two hours were the most testing of my day, I was asked how to set up the Service Cloud, how to choose a consulting partner, what is, and how to use process builder to name just a few. Myself, Kerry Townsend, and Claire Jones did not stop but it was extremely rewarding, I passed on the baton at the end of my shift knowing that I had helped a large number of people. 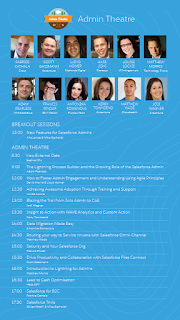 If you get the opportunity to volunteer at a Salesforce event in the future I urge you to take it, I am so glad I did. Soon after this the alcohol started to appear and I felt like I could relax. It had been an amazing day but I have barely moved outside of the Trailhead Zone, why oh why wasn't it a two day event? After a couple of glasses of Pimms courtesy of Docusign and a quick catch up with a few people, it was time for the boat party. I have to admit to being a bit of a lightweight as I abandoned the party once back on terra firma and after I saw the length of the queue to get into the Cafe de Paris but it had been a long and AWESOME day. Roll on Dreamforce and World Tour London 2017!